THAT THERE’S ALWAYS SOMETHING TO GROW IN. I HAVE NOT ARRIVED. FOR MISSIONS AND FAITHFUL MISSIONARIES. Truly, my heart in using a little service like that is to remind myself that I need to be grateful. Not just grateful for things, but grateful to the Savior for all He’s doing in my life. Should not my life be lived out of gratitude to Christ for all He’s done and is doing in my life to make me more like Himself!? I believe I should, and all Christians should! Today I received that text message and I only had one response. What am I grateful for today? The birth of my daughter, Karis. We are celebrating her first birthday today and it’s something unique and special. As you may recall, when Karis was born we were living in Czech Republic. Karis was born in a town called Ostrava-Svinov at a hospital with very few English speakers. It was a scary thought that my wife would give birth to our daughter in an unknown place, while also having very little help from medications we use in the States. But God was so gracious to Bethany and me as Karis came quickly and she was born healthy! As I re-read my own account from this blog of her birth (click here to read it), tears filled my eyes just remembering that day. God was so faithful! But here we are one year later. Today we’ll celebrate alongside some of our family who is in town to visit, but we’re not in Czech Republic anymore. We’re here in California in what seems still like we’re waking up from a dream. Did we really do that? Did Bethany really give birth to Karis in Czech Republic?! Did we really live there!? These are the thoughts that sometimes race through my mind as I think back on the past year of our lives. What a whirlwind. What a crazy year it’s been. Karis’ birthday brings with it more than the joy of her birth, which is so special to us. It also brings with it the memory of a life we never thought we would live–the life of missionaries living overseas. The past few weeks Bethany and I have been reflecting on Czech more and more. We think often of our little apartment next to the church with the beautiful view out the kitchen window. We have missed the Spring rain and beautiful green Czech countryside. Avery has mentioned multiple times how she misses our yard “at Babicka’s house” and how she loved “how big it was.” We have cried some. I miss things like our little mini van with the stick shift. We miss the mall where the kids would play while we “splurged” on a McDonald’s meal that was 45 minutes from our house. We miss the bike ride to the river and the walks around our little town, even when it was literally freezing outside. We miss learning the language and trying hard to communicate with strangers and even with friends. And yes… our friends, we miss them dearly. 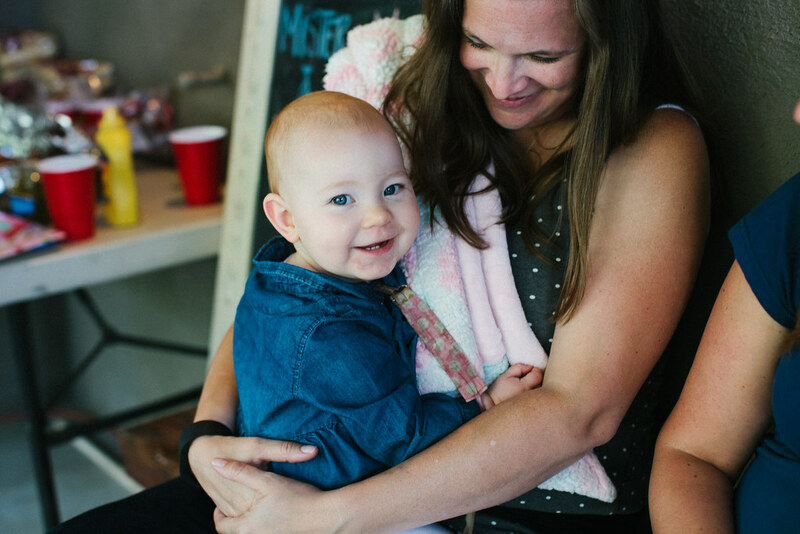 “But wait… I thought this blog was about Karis and being grateful?” you ask. Well, you’re right. It is. You see, when I think about Karis’ birthday, I can’t help but think about our time in Czech. In a real sense they go hand-in-hand. Karis’ birth was a bright spot in a time of uncertainty for our family’s future. Her little life brought us so much joy and I praise God regularly for that special gift. Karis is always smiling, even to this day. 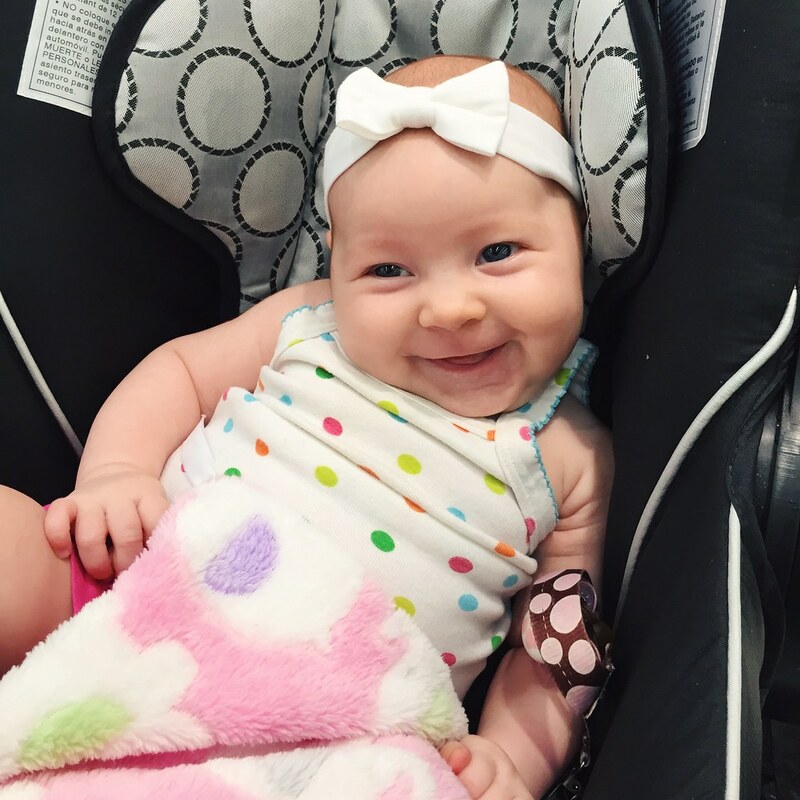 She constantly smiles…it’s amazing to me. She has been a very easy baby and even now while she has begun crawling around our house, I just look at her and think how gracious God has been to us. And that grace has been shown to us through her life and what God has done in our lives. Did we think we would be sitting here in the States a year later? Honestly, no. But I do know that we serve a very gracious God. Sure, we have had a whirlwind of a year, but I also know that God has moved and worked mightily through it. Bethany, our kids, and I would not be the same today had it not been for the past year. As we celebrate Karis’ one year of life we can also celebrate the grace of our Lord, Jesus Christ. He is always faithful. He is always trustworthy. He is always working for our good and His glory. He is always gracious. I just can’t get around it: it’s all grace. It’s really hot right now. According to a Czech news Web site, we’re experiencing some of the hottest days on record in Czech Republic. That wouldn’t be a problem except for one big factor: no air conditioning. Now I want to make sure I’m really careful about what I say and how I say it. I know, for instance, of missionaries who live in intense heat all year round. They have to live with constant warm air in their house with very little relief. That is not the case for us whatsoever. To those friends and missionaries that serve in unbearable heat week in an week out, God bless your ministry. I mean it. Just little taste of the heat this past week is reminding me to think and pray for you, wherever you may be. That being said, I do want to comment on what we’ve been trying to do to escape this heat. Our apartment just holds heat in. With concrete walls and no air conditioning, we’re just stuck trying to get air to move through the house. Over the weekend we just couldn’t do it anymore and decided we were leaving town to a large mall in Poland to find some AC. On Saturday we basically the entire day there, walking around, eating meals and letting the kids play in the air conditioned play area. Judging by the number people there I think they all had the same idea we did. Above is a photo I got of Karis while Bethany looked around one of the Polish stores. 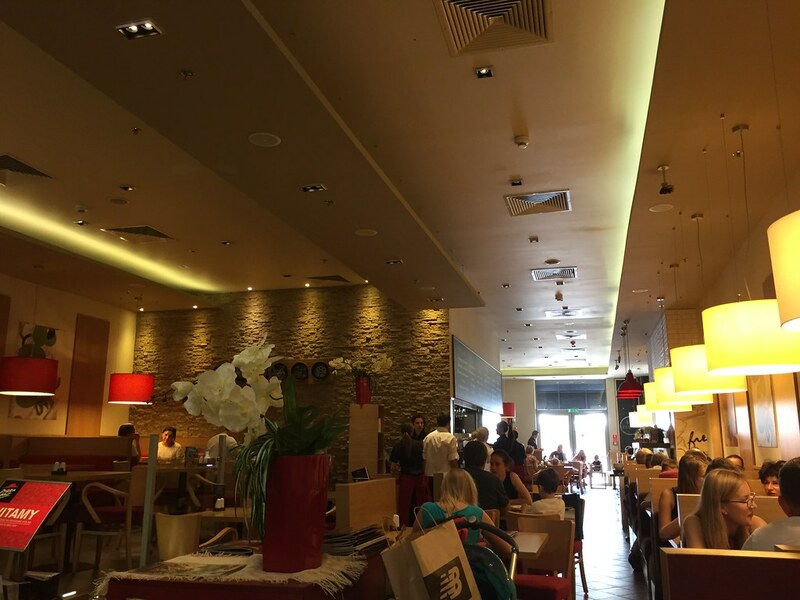 When we got to the mall, the first place we decided to go was to Pizza Hut (shown above). 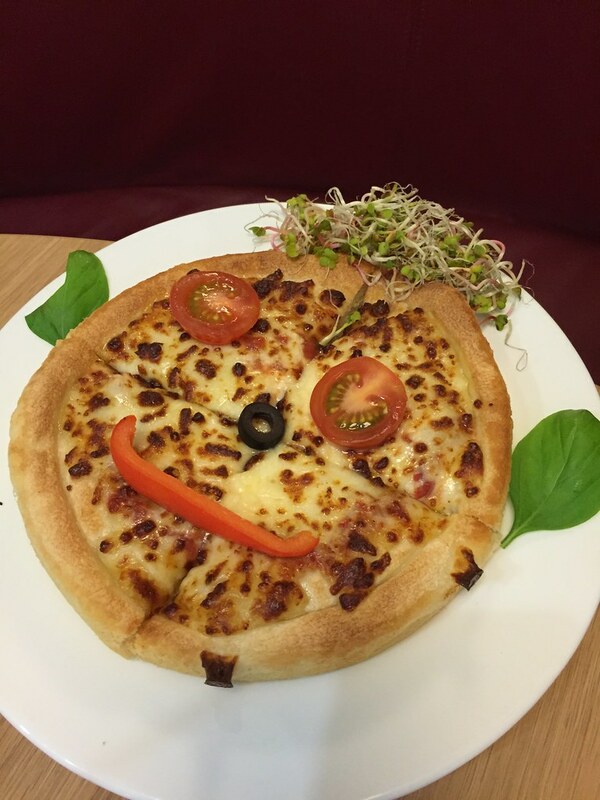 For you American readers, you’re going to have to lay aside all your preconceived notions of what Pizza Hut is and allow me to tell you about Pizza Hut in Poland. To compare it, it’s more like California Pizza Kitchen. It’s a fancy, sit-down, restaurant (at least this one was). We had heard they were nice, but we were shocked. They had waiters, lots of salads and pasta on the menu, and really good pizza! We all ordered pan pizza, except for Titus because he wanted spaghetti. Everything tasted it great and we even decided to go for the Chocolate Chip cookie dessert which was an oversized cookie with vanilla ice cream on top. It was a lot of fun and here’s a picture of Avery’s pizza. After food we did some shopping and eventually grabbed some coffee. The mall we went to is huge and we eventually made our way to the kids play area. 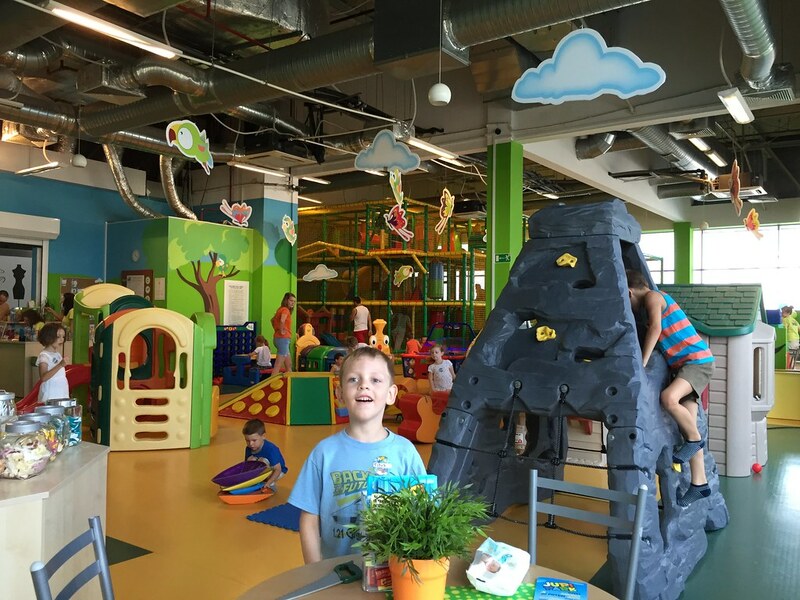 You pay a few bucks for an hour of play time and they have staff there to help the kids and there’s a ton for them to do. Why America hasn’t jumped on this money making machine is beyond me. I sat and read a book while the kids played and Bethany did a little shopping with Karis. Here’s a photo of Titus with the playground behind him. Since we were going all American on the food we decided for an American class, Burger King, for dinner. We wanted to get the food to go and head to the hardware store to look at little air conditioning units. 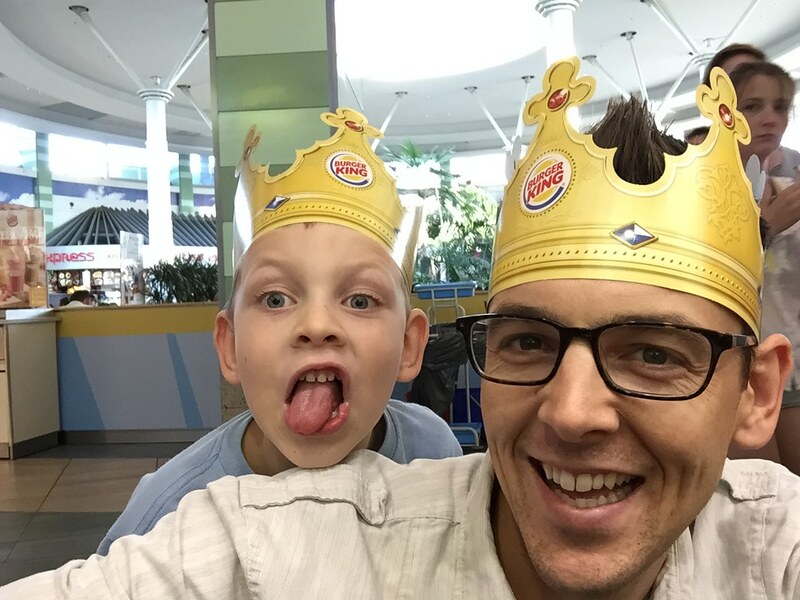 Titus went with me to order the food and we got those Burger King crowns which I wore through the mall with Titus all the way back to the car. At points their were Polish people tapping each other on the shoulders and pointing at me because I’m sure I looked ridiculous. Bethany and the girls were in the car and when we got there Bethany was just laughing at me and said, “You’re a good daddy.” Thanks, babe. I’m sure you were laughing WITH me and not AT me. 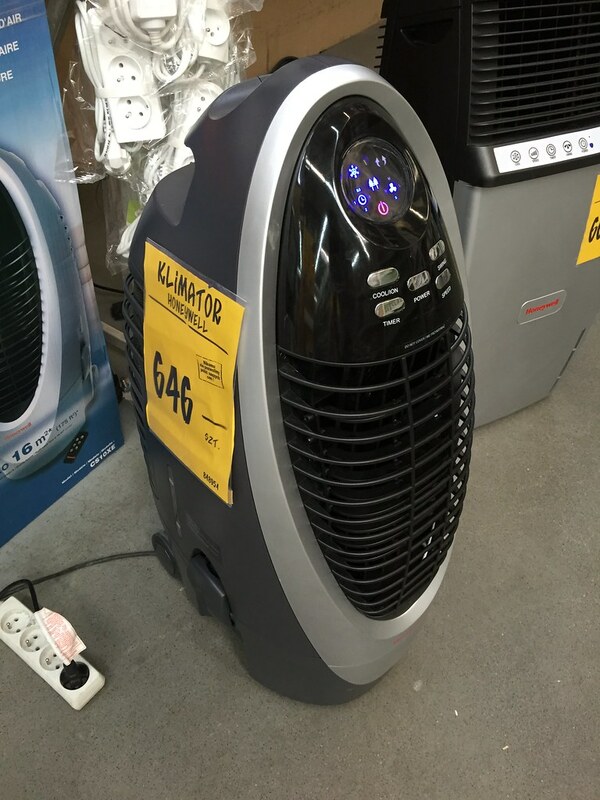 We tried six different stores to find a little air conditioning unit that was both powerful and affordable. This is no easy task in a place that doesn’t really have AC. What we ended up finding and buying was a little unit that was around $160 (US) that we currently have sitting in our window sill. It’s a swamp cooler that uses water to cool down the room and it’s been a pretty big help the past few nights. Here’s a photo of it in the store (the price on the side is in Polish currency). I’m calling it R2-D2. The next day we basically did the same routine, only this time we went to a Czech mall instead of Poland. Essentially all we did was go there for lunch, walk around, and let the kids play. 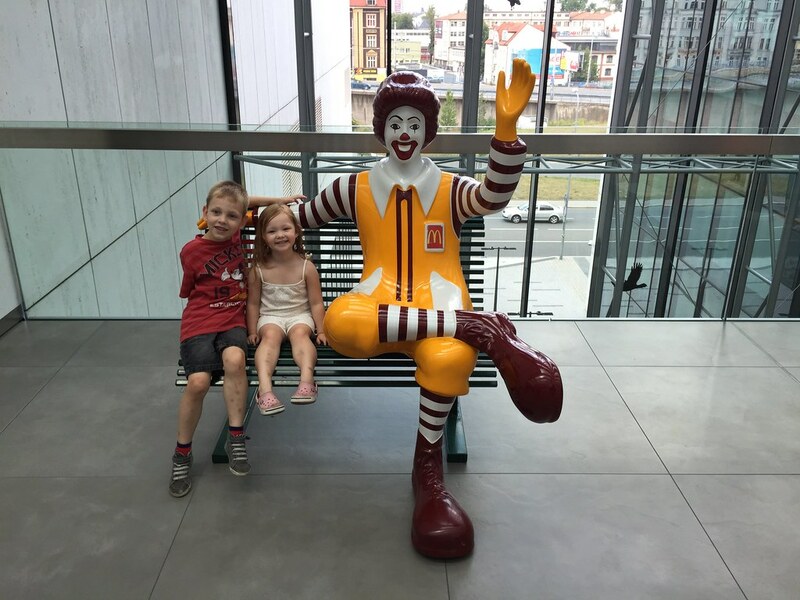 There was a bench near the kids area with Ronald McDonalds so I took a little photo of the kids next to him. Quite honestly I’m a little jealous that Ronald gets to sit there all day, enjoying the air conditioning looking all happy. We’re trying to have a positive attitude, but it’s been rough. Right now I’m sweating, we have six fans running, and we’re sleeping in the living room because it’s just too hot in the bedroom. Every time I get hot I just go and take a cold shower which really does help. The weather is supposed to be like this for at least the next week so we’re buckling up for more heat. If you think of it, pray for us, especially our kids. It’s hard to sleep when you’re sweaty and hot and we’re all trying to just make it through until cooler air comes our way. Editor’s note: This post is the third installment of a three part series. If you haven’t read the first two, please click here for Part 1 and here for Part 2. With us being so sick, our appetites were gone but the kids were hungry. Somehow I needed to get out of bed, go to the store, and get food for dinner. So I forced myself out the door and to our car. That was around 3:00pm and it was the first time I had been outside that day. I remember thinking I didn’t even have the energy to drive the stick shift and it slipped out of my hand just trying to put it in reverse. I paused and tried again and got out of the driveway. Thankfully the store was only about a mile away, so it wasn’t too bad getting there. At the store, I walked slowly and gingerly down the aisles probably looking like a crazy person clinging to my cart for support. My stomach was still hurting and nothing sounded good to me, but I needed to get anything I could think of for the kids to have food (I like how this sounds like a wilderness survival story all of a sudden). I don’t remember what I bought, except for some Sprite because we thought that would feel nice on our stomachs. I remember being sad because I really wanted ginger ale but couldn’t find any. During the late afternoon (around 5pm) of that second day (Tuesday), I also managed to take the kids to the pool across the street. The above photo is all I have to prove that I was there. Bethany stayed back and laid in bed, while I laid down on one of those outside pool chairs and let the kids play in the mini pools. I felt so bad that they had been cooped up inside all day so again I just tried to push myself. Mostly, I just remember laying there and hoping I would feel better which was slowly starting to happen, although my appetite was still gone. I never got in the water despite the kids desperate pleas. Since there were two little kid pools I found a spot in the middle while the kids ran back and forth jumping in to both of them. Beyond that I can’t remember what we did that night but I know we went to bed early again. I may have had a peanut butter and jelly sandwich in the evening, but outside of that I didn’t eat anything that day. On Wednesday morning (our third day of “vacation”), we woke up and felt a lot better but were still not 100%. We got a lot more sleep and I think Karis slept well that night too, which gave Bethany a little more sleep. By mid-morning my appetite had returned and I felt well enough to return to the store again for some fresh food and I told Bethany I would take the kids with me. When we got back from the store and walked in to the apartment the air conditioning wasn’t running which was weird because it had been running almost non-stop since we arrived (What can we say? We’re Californians!). I asked Bethany about the air conditioning and that’s when she said, “The power went out.” Come again? “About ten minutes after you left for the store the power just went out.” Oh no. It was now a little past 10:00am. I immediately tried to find the electrical panels and breakers to see what I could do. I searched the entire house using my iPhone flashlight and found nothing so I went outside of the apartment and checked the hallways. I found an electrical panel wall for all the apartments but I didn’t see any breakers or ways to turn the power back on. I went downstairs and found another wall of panels, this one much bigger, but all I saw were these big buttons beneath each apartment’s meter. I tried pushing a few but nothing happened. Finally, I just texted the apartment owner and said, “There is no power in your apartment. Please help.” He didn’t respond right away so I tried calling his number and got no answer. I was really at a loss now. The apartment only has electric appliances so now our lunch was on the line and this whole vacation was already so far off the mark it was laughable (however, I wasn’t laughing). I had the number of the apartment manager who doesn’t speak English, so I called him on a whim just hoping we could communicate. By God’s grace his wife was with him and he passed the phone to her and I was able to tell her we were without power. She told me he would come in 30 minutes. About an hour and fifteen minutes later he arrived, tried a bunch of switches, and left. Then he came back again with another guy, they pulled a picture frame off the wall which exposed an electrical panel, flipped all the switches, and still nothing. He left again. He came back a third time, said something to us we didn’t understand, and he was gone yet again. One problem: he never came back. We have been without electricity in the entire apartment for over 3 hours now. [The apartment manager] came but we can’t communicate and I don’t think he can fix it. We are thinking of leaving tonight because of this and would like to have a refund on one of our nights. Call [the apartment manager]. I hope you did not destroy something. Destroy something!? What?! It took me a while to realize that since English was his second language he didn’t really know how intense the word “destroy” came across to me, especially over a text message. Finally, he called me on the phone. Apparently he was in Miami doing some schooling but he called me to try to figure this out. He told me he couldn’t get a hold of the apartment manager, but that he called an electrician who was on there way. He then told me I was supposed to push the buttons on the electrical panel and I said I had already tried that. Eventually we just decided I would go back to the apartment from the pool area and wait for the electrician. Not long after we spoke on the phone two men arrived, one of them was the guy you see in the photo above. 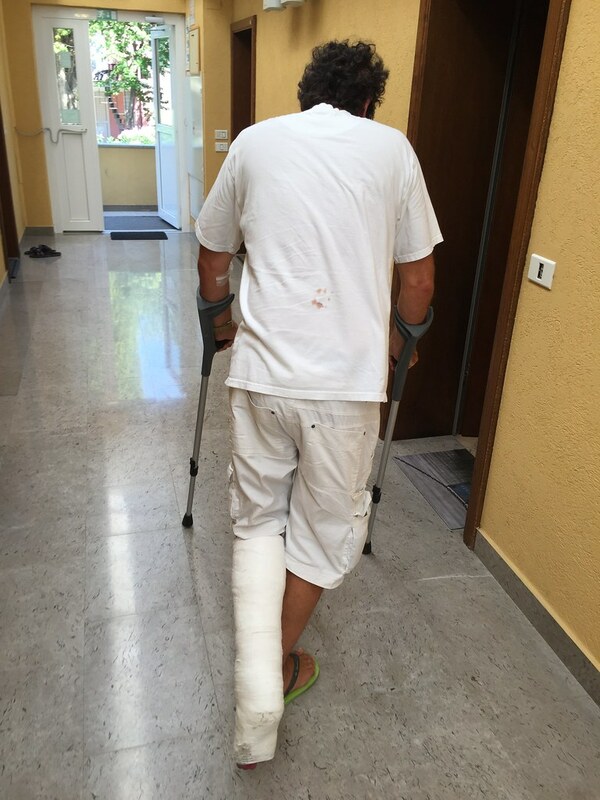 He had a leg cast and crutches, was wearing one sandal, and the guy with him spent most of the time on his cell phone. He motioned to me and hobbled down the hallway to where the electrical panels were (the same ones I had already looked at earlier). He started explaining something to me in broken English and then pointed to this button (photo below). That blank spot (the only one of about fifteen buttons) was our unit. He then hobbled with me back in to our apartment and asked me about a spoon. When I didn’t really understand he started going through the drawers of the kitchen until he found a wooden pasta spoon and we hobbled back down the hall to the blank button. 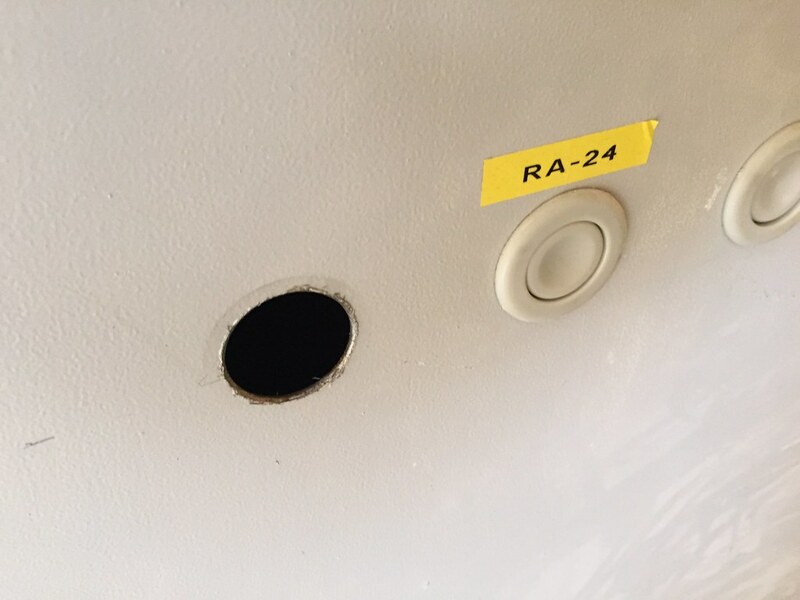 He stuck the handle of the spoon in that hole and I could hear the air conditioning unit fire back up down the hall in our apartment. YES! We had power again! The electrician showed me use the handle to push the button in case it happens again and that actually ended up coming in handy later when three more times the power would fail. When our family finally did converge back at the apartment it was around 3:30pm. The power had been out for over five hours. It took us another hour or so to figure out why the power kept failing, but basically it was that we couldn’t have more than two major appliances running at the same time (e.g. washing machine, AC, and oven). If we did that, the power would fail immediately when a third appliance was turned on. By this point in our vacation we were done. Bethany and I decided we had had enough and told the apartment manager we would be leaving around 8am the next morning (he eventually returned the apartment to check on us around 6pm). Even though I was feeling better, Bethany wasn’t feeling great but she asked me if we could seriously go find a McDonald’s. To be honest, we thought McDonald’s was our safest option at that point after the day we had. I found one on our GPS and we started driving there only to find out we were about 1 kilometer from accidentally driving in to Italy. I pulled the car around and ended up finding a McDonald’s in Slovenia where we enjoyed dinner. I tried explaining to Bethany that I wanted to take her to Italy on our vacation, but she didn’t think my joke was very funny (OK, she laughed at me, but it was a courtesy laugh). 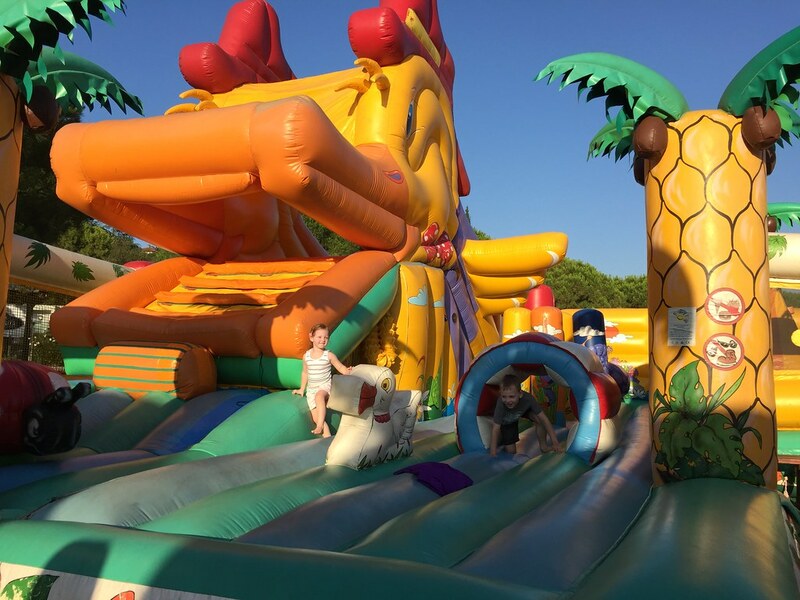 That evening when we got back to the apartment I took the kids across the street to a little bounce house area. They had seen it the night before and since we would be leaving early the next day I figured it would be fun last thing to enjoy. After we put the kids to bed that night, Bethany and I spent the evening packing and cleaning so we could leave in the morning. On Thursday morning (day 4) we were packed and ready to leave at 8am but the apartment manager didn’t arrive until 9am. We lost and hour of drive time (which I wasn’t excited about), but left for the 8+ hour ahead of us. The trip ended up taking 13 hours. I had planned for about 11 hours, but bad traffic, stops to eat and feed the baby, and intense weather extended the trip significantly. In the end we made it home in Czech around 10:00pm. As I said in the first post, I sighed a sigh of relief just seeing our driveway. Vacation stories are a part of life. Everyone has one and it’s always fun to talk about later when you’re removed from the situation. It’s been a week since we were laying in bed sick and as I look back I can chuckle (we’re not laughing yet–that’ll take years of counseling). 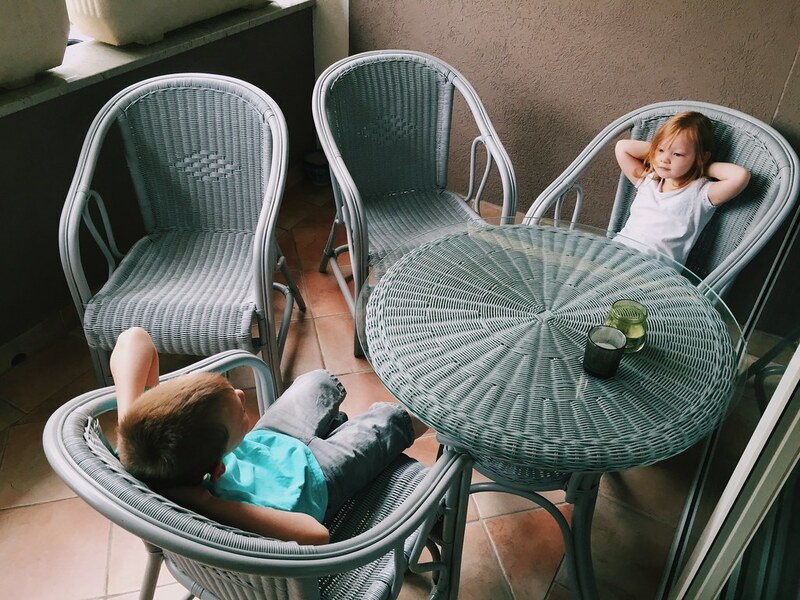 I found the above photo of the kids “relaxing” on the patio of the apartment just before we left and I’m reminded that even vacations are not about me. A good friend and pastor reminded me of that truth recently and told me “Remember: this life isn’t about you.” It’s not. 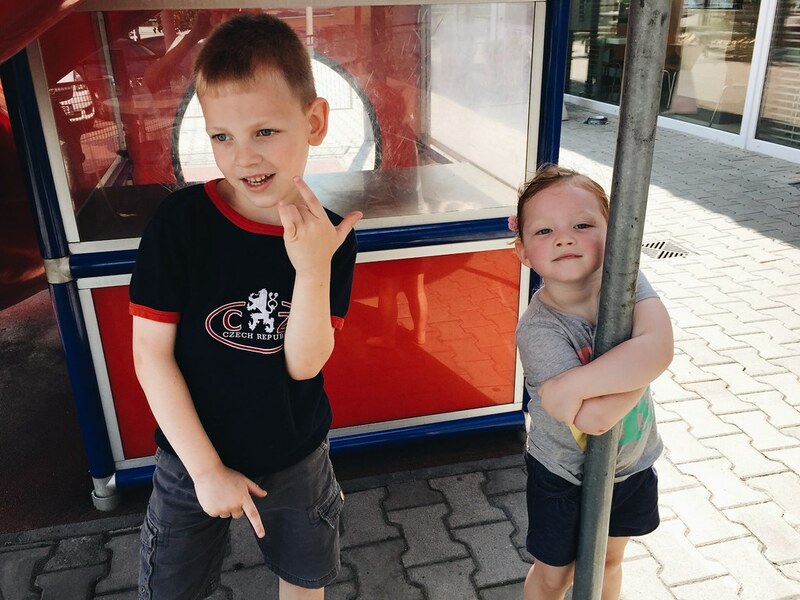 If my kids had fun, then I should be happy. If Bethany had fun (verdict is still out on that), then I should be happy. Even a week later the kids are still talking about the pool time and the fun we had on vacation. My memories are a little skewed in that department, but again, it’s not about me. We had our plans and the Lord had His. He’s a better planner anyway. Editor’s note: This post is the second installment of a three part series. If you haven’t read Part 1, please click here. 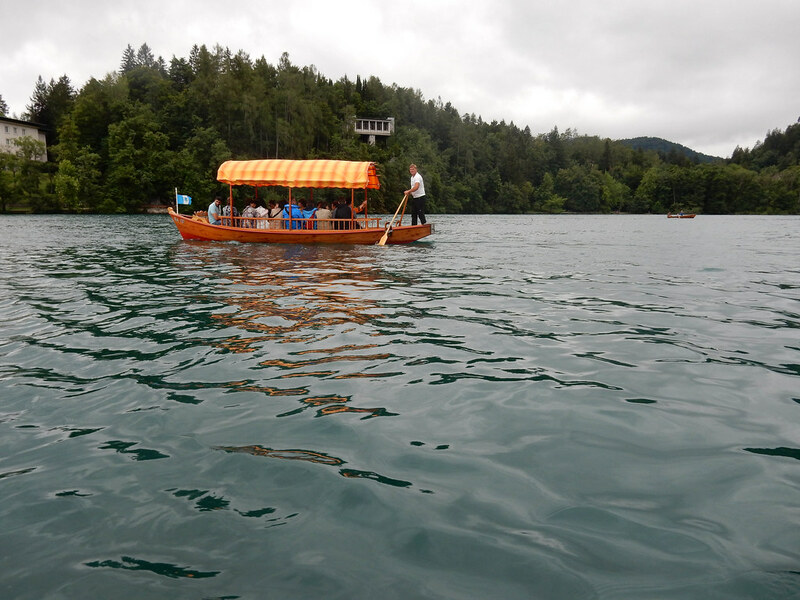 After all the fun we had at Lake Bled and the wedding at the castle, we were just as excited to head a little more south towards the coast of Slovenia which is on the Adriatic Sea. If you know you’re geography, then you know that the Adriatic is the water that runs on the east side along the boot of Italy. 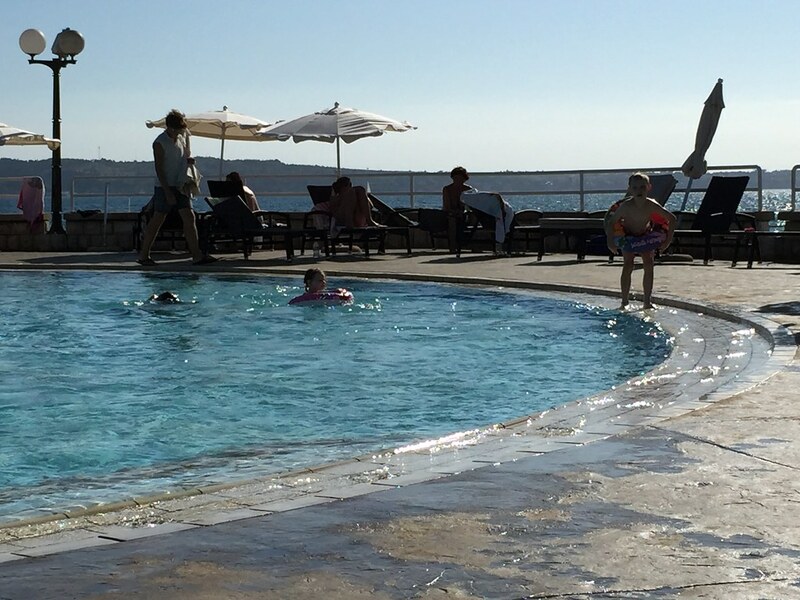 Again, we rented an apartment through Airbnb.com in a town called Portorož. It’s a city that is literally across the sea from Venice, Italy (see map below). Living in landlocked Czech Republic, we have often just longed for some ocean water. Our plan was simple: live by water and just swim every day. We were only going to be there Monday afternoon through Thursday morning, so a simple plan made sense. If we got tired of that we had even considered a day trip to Venice just for the fun of it and to say we did it. The apartment we ended up renting was affordable for three nights and it was a five minute walk from the sea. What could go wrong?! When you rent from Airbnb.com you speak directly with the apartment owner via text or their smartphone app to setup meeting times and to get the keys. In our case, the guy I was talking to online spoke English and said he had an apartment manager who would meet us to get the keys. The time was set and when we did arrive at 2:00pm on Monday I tried calling and texting but no answer. Instead of waiting around, we decided to just go to the grocery store just down the street to get a few things for dinner since we would be making our own meals, all the while still trying to contact the property manager to get the keys. 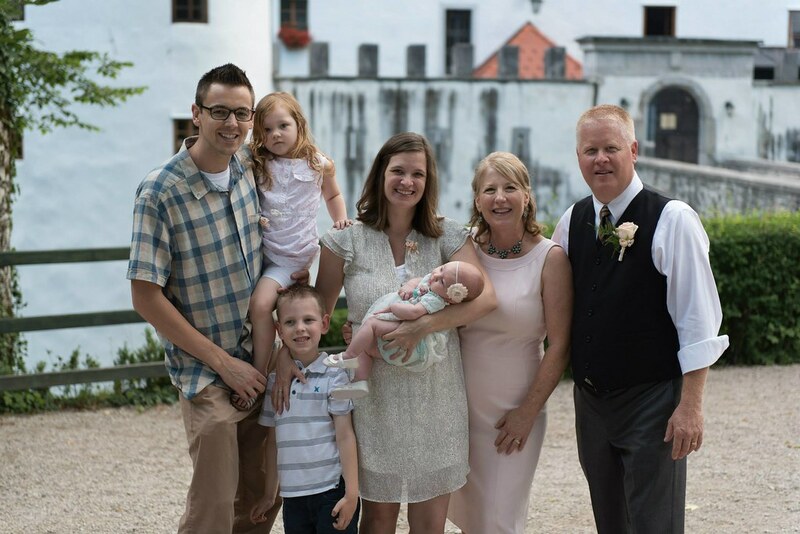 So I texted another missionary family in Slovenia to see if they could help. Thankfully, they called the guy for us and found out he doesn’t speak Slovene but some kind of “Croatian/Italian mix” (their description). Thankfully the missionary wife did speak enough of whatever he spoke and they said he would be there in three minutes with the keys. This all happened while I was walking around the complex trying to confirm which place we would be staying. The above photo is one I took of the outside of the building when I finally found the patio with the potted plants which was the only description I was working off of. When the guy did finally arrive he saw Bethany and the kids first and tried letting them in but had the wrong keys and had to go back to a pile of keys in his car to get ours. When we got inside the place was awesome. It had AC (a rare thing around here), good size rooms, and a nice kitchen–everything we needed for a restful time. The guy showed me around and told me a bunch of these I couldn’t understand at all and said goodbye. After we got settled in the apartment, we decided to try to do a quick swim since it was our first day there and we had some time before dinner. We walked down to the shoreline only to find out that it’s not really a shore as much as it’s a concrete area and you either jump into the water or take the stairs, much like you would get into a pool. As well, and quite unfortunately, we realized that we were in Europe at a “beach” which apparently also means that clothing is optional. I just tried to keep my eyes on our kids in the water who loved the roped off swim area. We had about thirty minutes of fun before drying off and walking back towards our new, temporary home. On our way back from the water, we saw a Mexican food place along the boardwalk called “Papa Chico’s.” It’s very hard for us pass up on Mexican food. I mean, we’re Californians–we love Mexican food! Not only are Mexican restaurants very rare here, they are usually not very good. In this case we figured it would be a winner because we were in a pretty touristy area so we decided to just eat right then instead of going home, changing, and coming back. The food was mediocre. Both Bethany and I ordered enchiladas, but she got chicken and I got beef. We ordered plain, cheese quesadillas for the kids which weren’t that bad. I said during dinner, “I’m not exactly sure what I expected, but it wasn’t this” in regards to my plate. The beef was more like chili (I guess?) and it all just didn’t taste right. I did, however, enjoy the Coke Zero that I didn’t intend to order. In the end we were a little disappointed but we were fed and walked back to our apartment. That evening Bethany complained of a stomach ache. She asked me if I was feeling weird at all and I wasn’t. Normally we would probably stay up a little bit and watch TV or read after putting the kids to bed, but Bethany felt like she needed to sleep off whatever was ailing her stomach and we went to bed a little early. At around 1:30am I was awoken by a loud crashing sound. I sat up in the strange room and tried to adjust my eyes to see anything at all. The two bedrooms are in the upstairs of the apartment and everything else is downstairs. The little AC unit was running loud and it’s located right in the stairwell so that was the only noise I was hearing now. I looked over and saw Bethany wasn’t in the bed and then proceeded to see if baby Karis was in her Pak-N-Play and she was. Upon standing up and walking to the bedroom door I called downstairs in one of those whisper yells, “Hello?! Is everything OK?” so as not to wake the kids who were asleep in their room. No answer back. I was pretty out of it so I sat back down on our bed and that’s when I heard Bethany faintly say, “Shay…help.” Oh no. In her race to the only bathroom at the bottom of the dark and unfamiliar stairwell, Bethany slipped on the tile and crash landed in the bathroom doorway. When I found her she was on the ground and emptying her stomach. We figured it was either the same stomach thing Titus had on our drive down or food poisoning. I wasn’t much help because the whole event was making me feel sick so I laid down on the couch. In the end, Bethany spent until close to 4am repeating the downstairs rush (minus the fall), while I laid on the couch also starting not to feel well myself. I thought it was just the events that were making me sick, but that was not the case. Bethany did get some sleep that night and I did too after going back to bed around 4:30am. When the kids woke us up at 8:00am Bethany asked me how I was feeling and I said, “Not good.” Something wasn’t right in my stomach and it would last this way until the afternoon when my body rejected what we ate the night before. I was sure it was food poisoning now. By God’s grace, the kids were happy to play with Legos that we brought with us for the majority of the day. I don’t remember personally helping them, but Bethany said at one point she made them some eggs while sitting in a chair because she couldn’t stand. Mostly, we just laid in bed that day, unable or not wanting to move. We’re back! Not just from our month long hiatus from the blog, but from our very first European vacation. Quite honestly, I sighed a sigh of relief as we returned home last night and finally turned the car ignition off after a thirteen hour road trip home. And now we’re one of those families–you know, a family with one of those vacation stories. Everyone has one. What began with wonderful planning (what did people do before the Internet?! ), check-lists (we still forgot the coffee), and perfectly packing the car (yeah… like a man), quickly turned in to a drama worthy of a book deal and a movie (still waiting to see if Ashton Kutcher and Reese Witherspoon sign on for the lead roles). Bethany expressed it well: “we need a vacation from our vacation.” So grab your popcorn and find a seat (I like about halfway up, in the middle) because here’s the tale in it’s entirety. We live in northeast Czech Republic, literally on the border with Poland and not far from neighboring Slovakia (in the upper right corner of Czech). This actually puts us within driving distance of some of those most beautiful cities in the world. Vienna, Prague, Krakow, Budapest, and Berlin are all about 3-5 hours away. If you want to see the beach you gotta work a little harder for it, but you can head south to the countries of Slovenia or Croatia for warm water and hot sun (or, for you romantics, you can get to Venice, Italy in 9 hours flat from our house). We decided we wanted to head south mostly because we had been invited to attend a wedding in Slovenia and since we would already be making the 7 hour drive we thought it would be fun to vacation there. Even Rick Steves (your favorite American travel guy) says, “Slovenia is the least visited and most underrated of Europe’s alpine countries.” So last week on Friday we left at precisely 7:57am and hit the open road for an entire week away. Alright! The drive was beautiful. 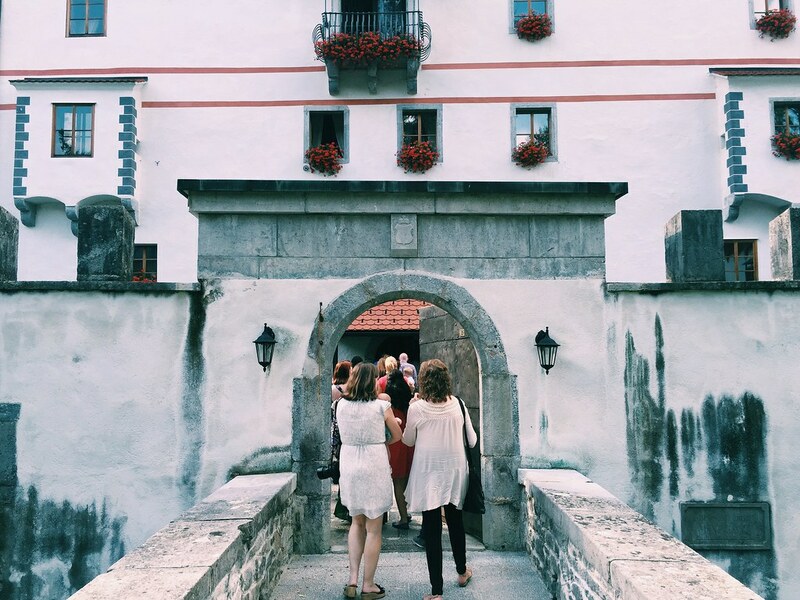 We saw all of Czech Republic, all of Austria, and then well into stunning Slovenia. We had to make planned stops every 2-3 hours to feed Karis, but the kids enjoyed the regular potty breaks and playing at the McDonald’s play places (shown above). The trip was mostly uneventful until about 30 minutes before we crossed the Austria/Slovenia border. Almost out of nowhere Titus said quietly from the back seat, “I am going to throw up.” We were humming along the highway at the speed limit but I took him seriously and pulled to the emergency lane and stopped the car. Bethany jumped out on his side of the car and as she opened his door Titus lost his lunch inside of our van. Had I been a little quicker maybe could have gotten him out in time, but the damage was done. Bethany proceeded to get him out while a steady stream of traffic was going by us (thankfully, we stopped at a turning part of the highway where traffic was going slower than the average 80mph). I then began unpacking the car on the highway to get to that one bag which had his clothes in it. The kids’ bikes, our backpacks, Pak-N-Play, and my camera bag all had to come out on the side of the road so I could open a suitcase and get Titus a change of clothes. Titus threw up four more times in the next two hours, once more in the car and on the side of the road. 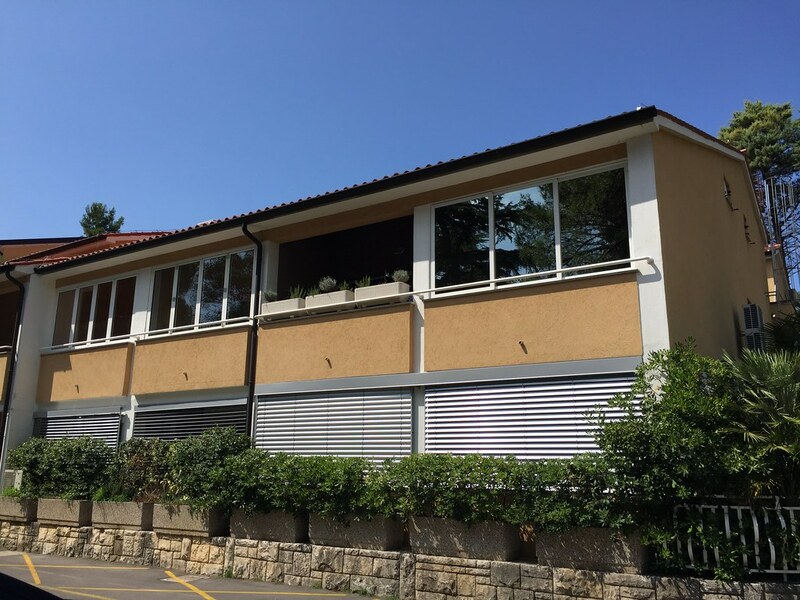 We ended up arriving about two hours late to the apartment we rented in Slovenia, but the lady was very kind and gracious with our situation (we rented it through airbnb.com). The place we stayed was really nice and we began running the washing machine as soon as we arrived. Titus didn’t seem to have any more issues and was feeling fine which, of course, we were thankful for. Everyone got a good night’s rest that first night and were excited about what the next day would hold. Without getting into the crazy details, friends from the States have a daughter who married a guy from Slovenia. They held two ceremonies, one in the States a few weeks ago, and one last week in Slovenia which we had the privilege of attending. The morning of the wedding (our second day of vacation) it was raining pretty hard. We had a little twenty minute drive from where we were staying to get to the the family’s house where all the festivities of the wedding would begin. On our drive we went right through a pretty wild storm. By the time we got to the house the storm had cleared and sun was shining! This wedding was our first since moving to Europe and it was a ton of fun. There are so many cultural things that we enjoyed. For instance, everyone attending the wedding met at the family’s house for a mini pre-reception thing. The family provided snacks and drinks and everyone gathered in the front yard and driveway while a young man played traditional Slovenian songs on his accordion. Some people danced and others just mingled while the bride and groom walked around and greeted them. Then we heard, “OK, we’re leaving!” and they handed us bags of candy. The girl who gave us our bag said, “We are going to caravan to the wedding and while we drive, if you see kids on the side of the road, throw this candy to them!” For our kids, that was a highlight. We saw a lot of kids on the side of the road and our kids would throw the candy and they would pick it up and wave. The long caravan of cars snaked their way through the little town en route to a Slovene castle (honking the entire way) where the wedding would be held. Here’s a short video I got of the front yard before we all drove away together. As you may have guessed, the wedding location (a literal castle!) was incredible. 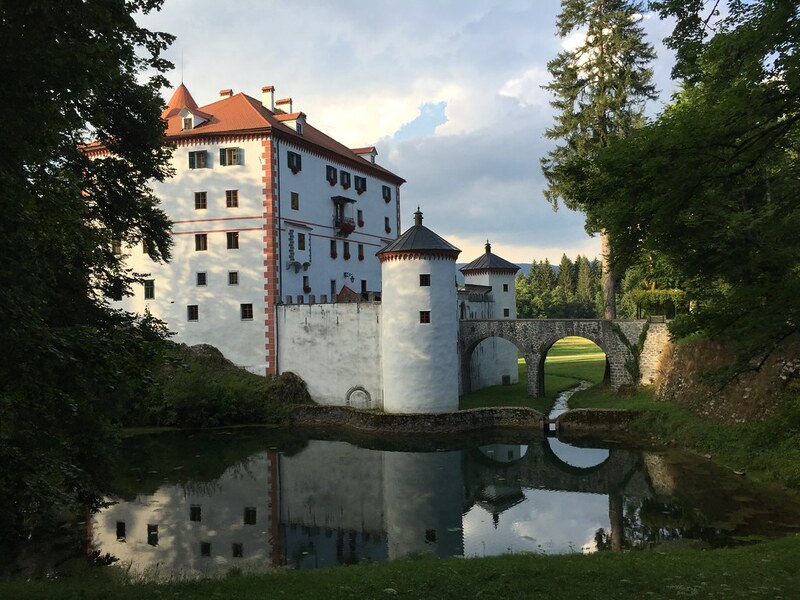 Apparently this particular castle is one of the few left in Slovenia that wasn’t destroyed. I don’t know all the history, but what I heard from someone was that it was used as a vacation home for royalty. Obviously, any wedding with three little kids in tow is not easy and this one was no exception. We did OK, but it was hot, a little muggy, and our kids were tired by the time we arrived, yet we still had a fun time. The kids loved the castle grounds and we even did a little exploring. We had fun visiting with our friends and of course seeing their daughter get married. Unfortunately we couldn’t make it to the reception (which was held at another location) because we really didn’t think our kids were going to make it. Slovenian receptions will traditionally last until 3 or 4 in the morning so we ended up leaving after the post-ceremony mini reception. Here’s a few photos from the wedding. And thanks to Larry for letting us use this last photo of all us! I will admit that I’m the worst at overusing the word “awesome.” Culturally that’s true as well. 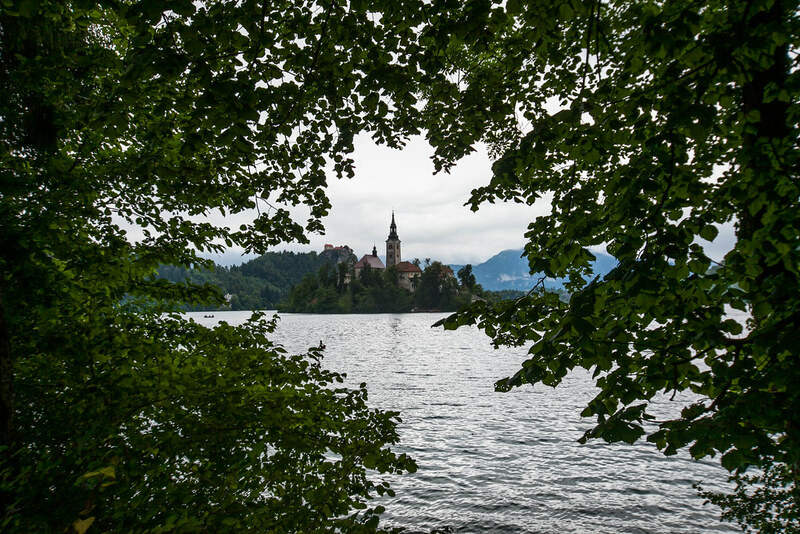 As the popular song from the Lego Movie says, “Everything is awesome!” Well, if everything is awesome then really nothing is awesome…except Lake Bled, Slovenia. It is truly awesome. 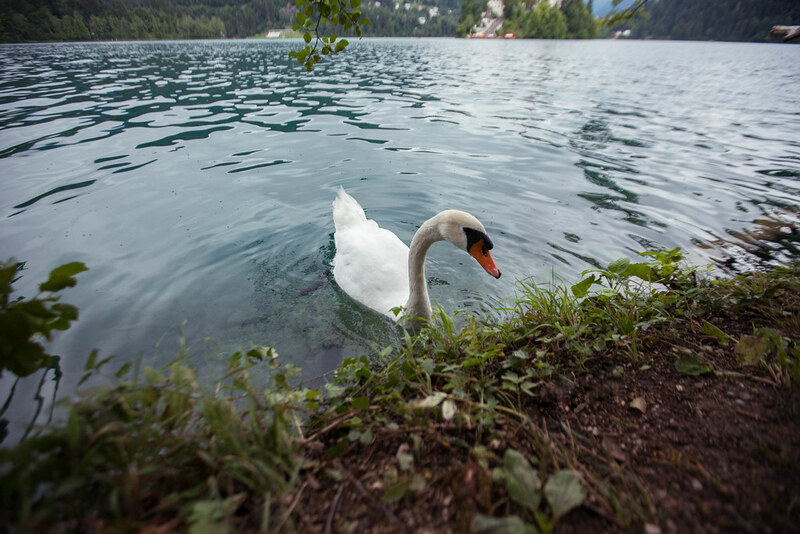 Lake Bled was a forty minute drive from our apartment and we went there the day after the wedding (if you’re keeping score, this is day 3). 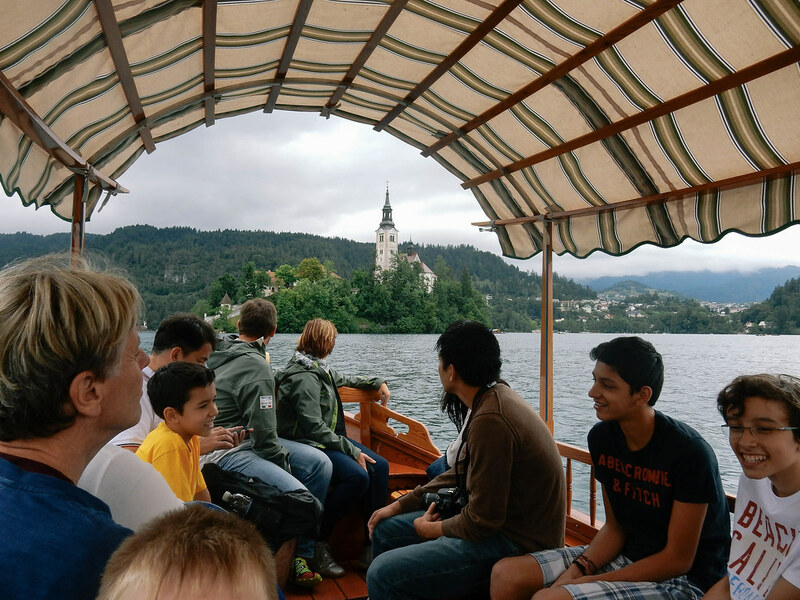 We actually saw some other Josiah Venture missionaries at the wedding and they helped us put some plans together for Lake Bled. They were kind enough to contact friends that work at the lake and we were able to do a few things there that we wouldn’t have done otherwise. We found a parking area on the north end of the lake and ate our home made lunch from the car and watched while people and cars poured in for some fun of their own. So many people from so many different countries were spending the day at the lake. After lunch we headed over to the shore, set up our stuff, and got the kids ready for some water time. 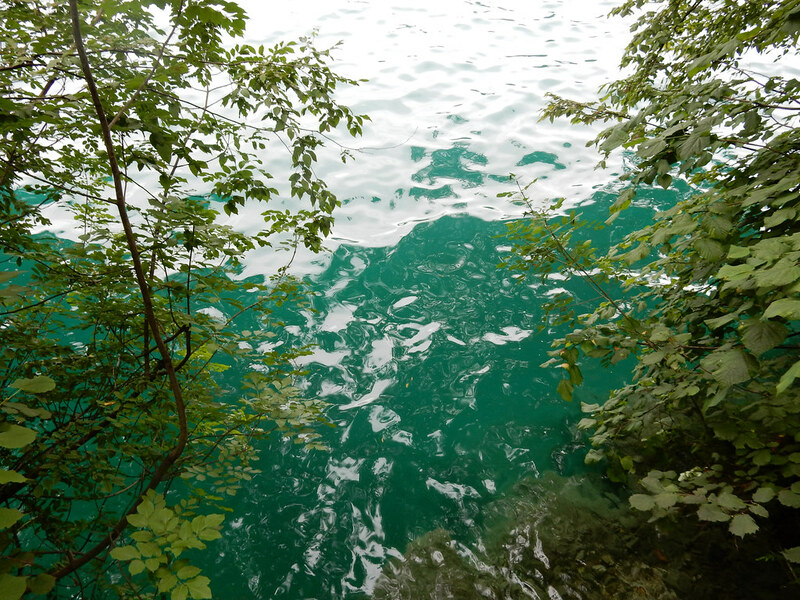 The lake was not only amazingly clear, it felt warmer than the outside air. We were worried it was going to rain, but the rain never came. The kids went for a swim while Bethany, Karis, and I played on shore. The wind was a little chilly but since the kids were having so much fun we didn’t mind. After the kids were tired of the water we decided to walk around the lake to where the boats were launching. Our friends told us to a find a young man who would be willing to save us some serious cash and take us to the island in the middle of the lake. The walk proved to be a highlight. 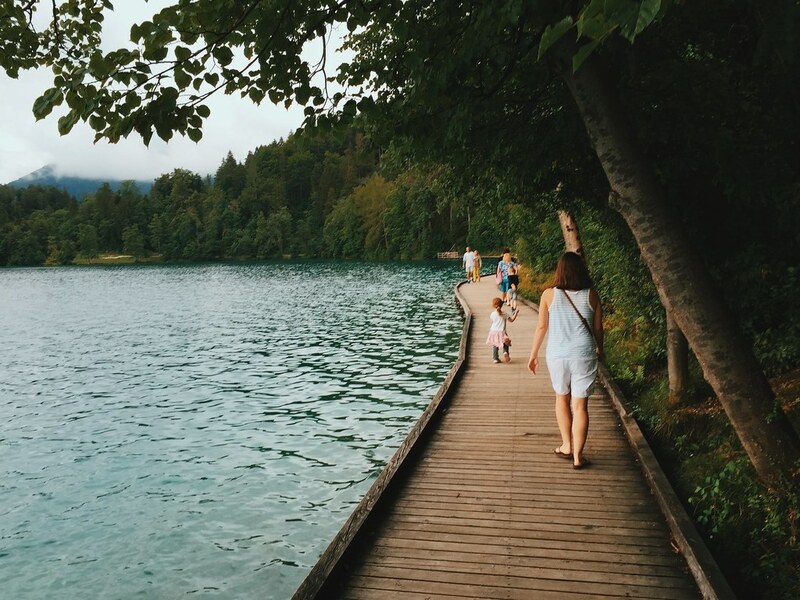 We thought it would be hard to get all of us around the lake but the walk is beautiful and right along the edge of the water. In the above photo you can see us walking on the path that they built right on top of the water. It was, you guessed it, awesome. 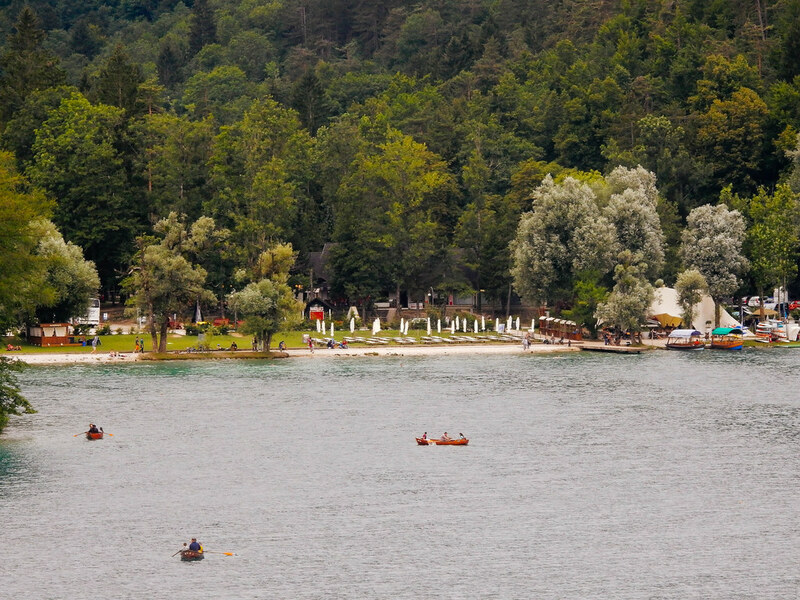 In God’s sovereignty, just as we were approaching the boat area, the young man we were trying to find was rowing a group of people back from the island in the middle of the lake. He said it would be no problem to take us out to the island at no charge! It’s actually kind of pricey, so this was really gracious. We joined another group and headed towards the island (it was our kids’ very first boat trip). As we boarding, Avery freaked and ran away from the boat because she was scared. I got off and grabbed her while the boat waited for us to board. Finally, she settled down and started enjoying it as we were slowly oared away. The island has a little coffee and cake shop, ice cream shop, and even a church. You can literally walk around the entire edge of the island in four minutes. We stayed out there for an hour and Bethany fed Karis in the coffee shop. I bought ice cream for the kids and me and we just enjoyed staring out at the water. Here’s a few photos from out on the island. We spent about an hour on the island before being rowed safely back to land (this time without any protest from Avery as we got on the boat). It was getting late in the day and we were hungry so we decided it was time to leave. Walking back to the car we talked about how much fun it was on the island and the lake and we were still enamored by the surroundings. 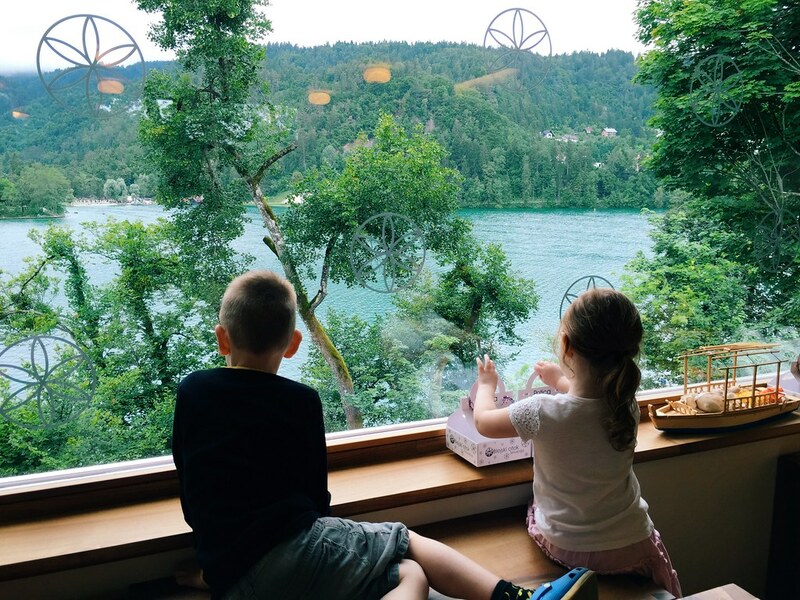 Shortly after departing our kids fell asleep in the car and we stopped off at a local burger stand for some dinner before heading back to the apartment for one more night. 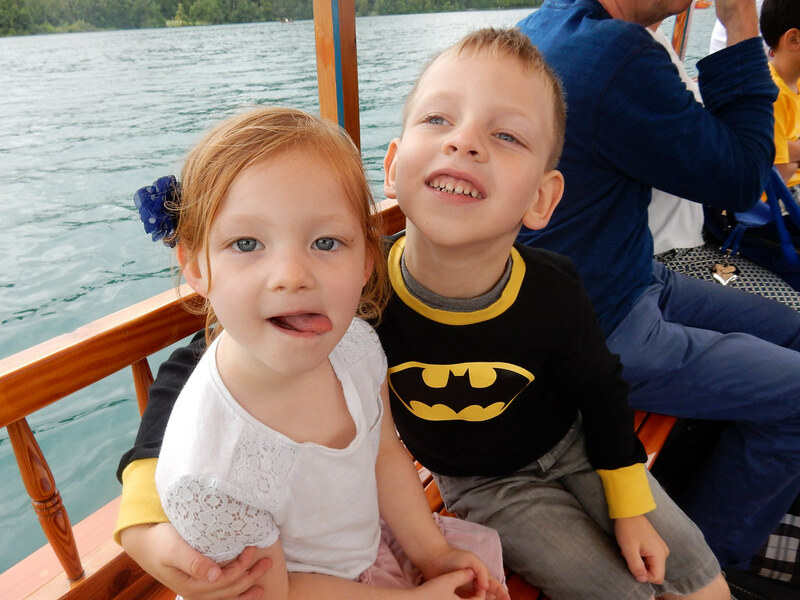 Our plans for the rest of our vacation included 4 days on the coast of Slovenia. All of us have been wanting to see some kind of coast or beach so that seemed like a safe bet. However, the Lord had other plans and for that part of the story you’re going to have wait for part 2!